Running Cold is a classic style horror novel by author Steve Zell. In a story set in a fictitious beachside community in 1960s Southern California, we meet our main characters, Michael and Brit Helm. Brit is Michael’s mother, a struggling woman who is trying to hold it together for her remaining child, having lost her husband and Michael’s older sibling, Nick. Brit wants total normality for Michael, and with very good reason: her son is a peculiar boy with an icy temper that can get out of control very quickly. Michael changes when he’s angry, quite literally, and it’s something people rarely survive witnessing. If he does lose control in his quiet new life, the worst things imaginable will happen, and Brit is right on the verge of breaking as it is. I love a good supernatural horror, and Steve Zell has all the makings of an excellent tale in Running Cold. I enjoyed the characterization of Michael very much, and seeing the damage that he can do was pretty horrifying right from the start. I felt terribly sorry for Brit all the way through the story, through her life and even beyond it. I have to say that some elements of the plot failed to tie in together as well as I’d have liked, but the overall atmosphere of the piece is well conceived and certainly keeps readers turning the pages. 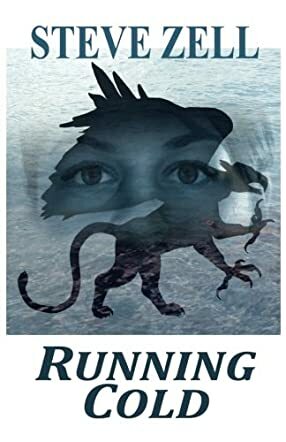 Running Cold will intrigue any horror fan, especially those who relish creepy children, supernatural transformative powers and what really lurks behind small-town ‘normality’.